With very different characteristics we have the wonderful small perennial, Senecio cineraria (pictured right) which is a mound forming plant with grey foliage and yellow flowers. 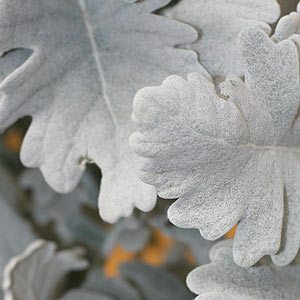 Perhaps one of the best ‘Silver Foliage Plants’ it is a great plant for adding texture and colour to the garden border. Also known as ‘Dusty Miller’, and Silver Groundsel, with soft felty heavily incised leaves, this useful garden plant will reach around .5m. Flowers in spring are a golden yellow, however it is the year round attraction of the foliage that is the main attraction. A drought tolerant sun loving plant S. cineraria is at home in a well drained soil in a sunny position. Best grown in a frost free environment. Excellent in sandy coastal soils where it requires very little care other than pruning back to maintain a bushy habit. For a mass ornamental planting use 1 plant per square metre. This is a varied group of plants some with garden merit and others that are weeds in some areas. Senecio are related to the daisy family (Asteraceae) and is some species are referred to as ‘ragwort’. Senecio are a large group of plants and species including the wonderful blue leafed succulent Senecio serpens.